Johnny Clock Museum - Fairfield, Iowa - Tune into our Vibe! A unique opportunity to see wood craftmanship at its finest awaits the visitor to the Johnny Clock Museum located just outside the town of Lockridge.This museum is owned and operated by John and Pat McClain and contains many unusual carvings which also just happen to be clocks.Perhaps which makes this so intriguing is that the artisan(John) works not from blueprints but from ideas formulated in his head. 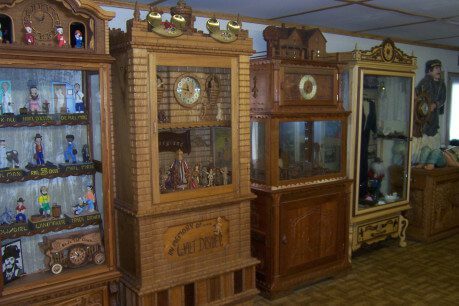 Since his youth,John is dyslexic and unable to draw plans to paper but his memory of his past is crystal clear and his ability to carve in wood brings those memories to life in the form of decorative clocks. Well over 100000 + hours of work are displayed in the ever-expanding collection.The museum is easy to find just off newly Highway 34 halfway between Fairfield and Mt Pleasant and it will also give you a chance to see the town of Lockridge (named for the ridges over Lick and Wolf creeks which appear to “lock” on the map. (Iowa Place-Names p.135,author Tom Savage)So if you are looking for a good “time” and something new to do,take the “time” to see the “time”at the Johnny Clock Museum.